Discussion in 'Approved Applications' started by Kvothe, Jan 12, 2018. On another minecraft server I was playing on. Then I checked it out for building inspiration. Tyrion Lannister, because even though the entire world (or most of it) seems to be against him, he manages to survive and top everybody's expectation. Unique skills? Not really, but I bring a lot of ASOIAF knowledge to the table, I've got somewhere around 9 years of minecraft experience, and before that I developed maps for a rip-off version of the MMORPG Tibia (also known as OpenTibia). I also have two years of admin-experience on a Minecraft RPG server. Here I was part of the development team for the server capital. So unique skills? No. A unique combination of skills? I should think so. After years of RPG servers and building on them (and in singleplayer, but that can only entertain one for so long), I'm looking for a new and challenging experience and I believe that helping create something that I love (ASOIAF) is the experience I'm looking for. I'd bring a lot of commitment, when my job allows me to (boring office job that consumes a tonne of time). Approved by Emotione11 on Jan 27, 2018. Not to be impatient or anything- but did I forget something? It's been a week or so and I haven't gotten a reply. Or does this usually take a while longer? Sincerest apologies for the delay! Feel free to message a mod if it takes more than 5 days for someone to reply. Anyways, thanks for the app, I'm happy to see your interest in our server. - Avoid using log blocks in houses (unless it's a log cabin), they usually aren't necessary and just make the house look too clunky. - Similarly, try not to do the stone arches in the base of the house. Generally, our modern building style tends towards simpler houses, without adding details for the sake of details. Instead, you should try to make the house interesting by trying different spatial arrangements, architectural elements, and integrating the house with its surrounding areas (which you already did to some extent). - Try to make the roof straight rather than curved- since this house is wide, a 45 degree angle would work best, but some styles use steeper rooves as well, which are usually done by alternating full blocks and stairs. - Don't use trapdoor blocks as building/interior elements except as actual trapdoors, since guests can toggle them and they also don't look very good. 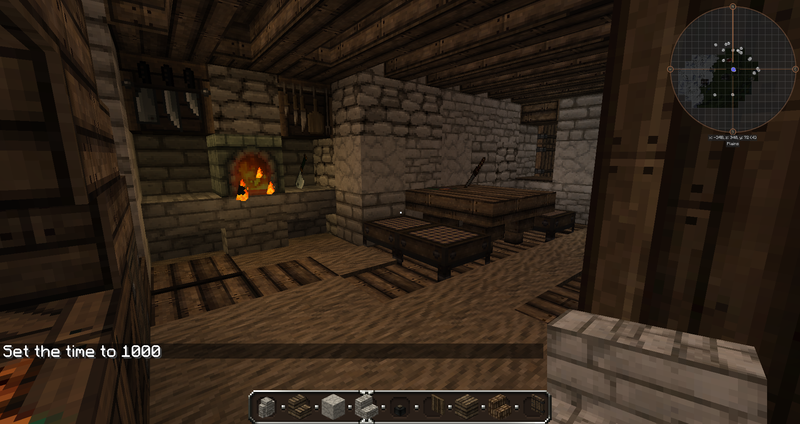 Instead, stick with half door blocks, and/or the wood textured carpet blocks. - Bookshelves would likely not be in an ordinary house like this, since only less than 1% of the population then was literate. They would only be seen in the very wealthiest manses, or special professions which require them. - Try to avoid having blobby vegetable gardens, make the fencing have square/rectangular shapes, but also try to integrate it with the house nicely. Make sure to have footpaths and everything as well, and small details (for instance, a vegetable crate block, shovel in the dirt, etc.). Think of what it would be like to actually harvest the garden in real life. 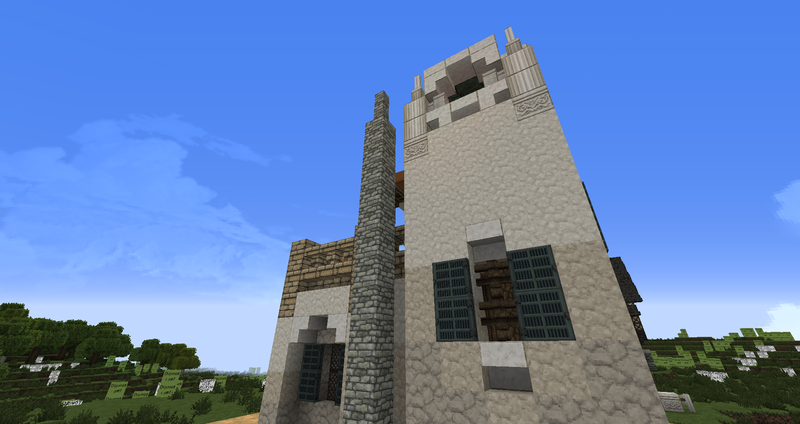 Before continuing, I would recommend having a look around at some of our more recent builds, such as King's Landing. Study the techniques we use for the exteriors and the interiors there. Also make sure to check out helpful warps like /warp furnish and /warp gradient. Once you've done those, for a challenge build, please make a middle-class house in the style of /warp sweetport. Good luck! Wazgamer and Kvothe like this. Right. Noted. Will get back on this. Wazgamer and Emotione11 like this. So, I did an attempt, though I have to note that I had a plan in mind, but the building turned out rather large. As such, I split the building in half, decorated one house and let the other be. I hope it's not a big deal! - In the garden you're using a vanilla crop block- you can tell because the texture and colors don't match the rest of our blocks, it seems way too neon instead. Make sure to avoid using any blocks which have the default vanilla textures. - I would recommend using the "plain white daub" block a tiny more on the front of the house (the side with the market stall), just to help simplify it a little more. You did this well on the side of the house. - The log balcony supports don't necessarily look bad in this case, though I'd perhaps still recommend playing around with alternatives, and at least dropping the buttons on the ends of the logs, which aren't really necessary. - Don't mix the large stone brick and the small stone brick like in the garden wall. Just do one or the other, depending on how ornate you want it to be- for an average house you should just make the wall uniform, i.e. just use small stone brick for the top part. - I might recommend lowering the ceilings inside the house one block, and/or creating more seperate rooms. Right now it feels as if there's a bit too much empty space. - Whenever you do slate rooves, make sure that it's supported on the inside as well. I usually just cover the ceiling on the inside with wood stairs + half doors. 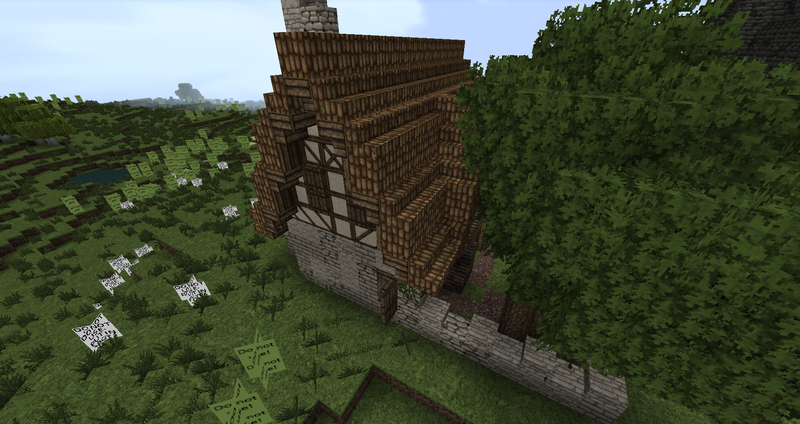 For another challenge build, please make a middle-class house in the style of /warp woodwright. Good luck! All noted, thanks for the feedback . Will get around to the next challenge somewhere this week. - I'd still work on your veggie gardens a bit more, this one seems a little bit plain. Also the vegetable patches aren't large enough- ideally you should have small patches of the same veggie type in their own spaces, but you mixed a bunch of veggies into a tiny area. 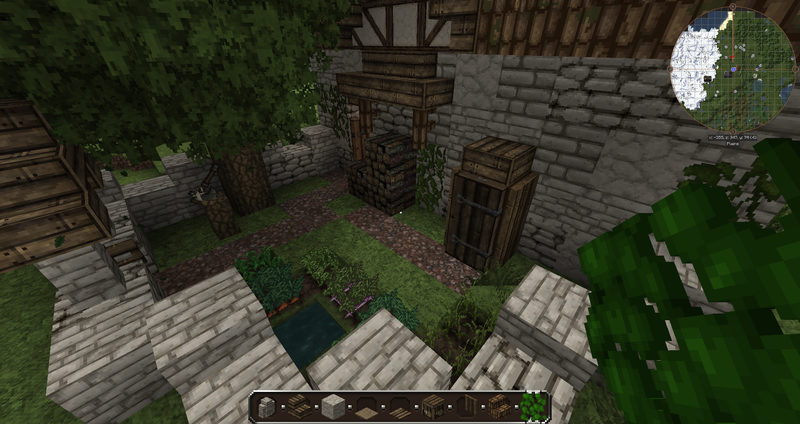 I'd recommend looking around at garden examples on our server some more. Tons of them in King's Landing sprawl. - I'd get rid of or change the wood overhang here, or at the very least get rid of the slate fence supports. Those don't really make sense, since it represents slate tile. - In the base of your house, don't mix stone blocks randomly. Rather, try to make a smooth gradient from one texture/color stone to another. Also, for a small house your stone base shouldn't involve more than 3 types of stone at the very most (more often you just use 2). I recommend looking at /warp gradient. - The chimney is a slight bit too tall, it looks a bit out of proportion with the house. - The furnace area here seems a little awkward to me. I'm not quite sure how to explain it; it's mostly just the way there's two indents on either side. I would just try restructuring it a little. For another challenge let's try something a bit different: please make a house in the style of /warp ghosthill. Good luck! Cheers, thanks for the positive feedback! Will get working on this. VonSchwarzenberg and shel like this. Great work! You've nailed all of the important aspects of the build, especially the gradient which is the tricky part of Ghost Hill. Only comment I have this time is that I'd generally avoid using 2x2 windows except for in very particular circumstances. Especially in Dorne you wouldn't want to have that many windows, since in deserts it becomes super cold during the night. Also, I'd probably alter the chimney here, which looks slightly strange just standing tall by itself like that, sort of like it was just tacked on. For a tentative final challenge, please make a middle-class house in the style of /warp fairmarket. The style here is a bit more involved than the previous ones, so make sure to study it well. Good luck! I should note, my in-game name differs from my forum name (not sure why, but out of habit I always have a different forum name than in-game name). It's HeerKarel, should this challenge be good enough to earn me proby-builder-rank. Great work again, you nailed it! My only feedback is that I'd get rid of the "stripe" of brick daub & wattle in the overhang. If you consider the way daub & wattle is usually made, with smearing the daub mixture on wooden frame in batch and letting it dry, it doesn't really make sense for one row to be brick. Other than that, great work, so consider yourself approved! Ask a mod in-game to promote you to New Builder if it doesn't do so automatically. And also make a probation thread in the probation forum. You can start building at any open locations on the server; a probie leader will post on your thread and continue to give you constructive feedback on your houses until the end of the month, in which case you'll be fully promoted if there are no further problems. Welcome to the team, I look forward to building with you! Awesome, thanks! And thank you for the great (and positive) feedback! I'll read through the guide and then make the probation thread.